A young Perth woman has died from meningococcal disease, the latest in a wave of infections that has seen almost twice the number of meningococcal cases in 2017 compared to last year. The Health Department says the latest victim — a woman in her 20s — is the fifth person to die from the W strain of the disease this year. The woman's family does not want to reveal any details, but her work colleagues at a government department were informed following her death last week. A Health Department spokesman said they have been advised to seek medical attention if they had contact with her in the lead up to her death. So far this year there have been 40 diagnosed cases of various strains of meningococcal compared to 23 cases last year. Of these, five people have so far died compared to three deaths last year. Of the 40 cases in 2017, 18 have been cases of people contracting the W strain — much higher than the long-term average of one case a year. 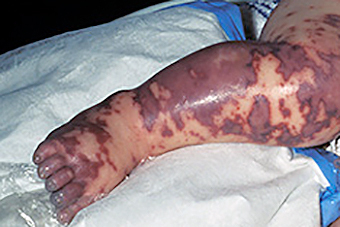 Last month a young child became the fourth person in WA to die from meningococcal this year. Two other people — including another child — were diagnosed with the disease around the same time. WA experienced a dramatic peak of peak of 86 cases in 2000, but this fell to just 16 cases in 2013. The Australian Medical Association has warned there could continue to be more cases this year as spring and early summer were the peak season for the disease. The condition is an uncommon, life-threatening illness caused by a bacterial infection of the blood and/or the membranes that line the spinal cord and brain, and occasionally of other sites, such as the throat or large joints. In January, the State Government announced it was providing free vaccinations at high schools for teenagers aged 15 to 19 to protect against strains A, C, W and Y. The program was expanded in August when it was announced teenagers would be able to access vaccinations against the W strain at GP clinics. West Australian Health Minister Roger Cook described the death as a tragedy. "It's very sad to lose anybody in the community to such a particularly nasty disease, but Western Australia is doing everything we can to protect West Australian citizens from meningococcal, particularly meningococcal W," he said. "We've got a community campaign vaccination program which is taking place in Kalgoorlie. In addition to that we've also got a statewide program focused on the 15 to 17-year-olds." Mr Cook said he had written to Federal Health Minister Greg Hunt urging him to introduce a national vaccination program. "We're doing the heavy lifting on behalf of the Federal Government, as is often the case in Western Australia, and it's time the Federal Government got its act together and introduced a national program so we don't have these outbreaks." The Federal Health Minister's office has responded to the criticism with a statement. "Minister Hunt is working with the medical and pharmaceutical sector on advancing new listings for meningococcal vaccines," the statement said. "Under legislation made by the Australian Parliament, the Government can't include a new vaccine on the National Immunisation Program unless it has first been recommended by the independent Pharmaceutical Benefits Advisory Committee (PBAC). "Minister Hunt encourages the pharmaceutical companies developing new vaccines to come forward to the independent committee for consideration. "We realise that many people have concerns regarding the various strains of meningococcal and that's why it was one of the first issues Minister Hunt raised with the chief medical officer on his very first day in this job." It is not common, but it is potentially life-threatening. It can cause disabilities if not treated. It is caused by bacterial infection of the blood, or the membranes that line the spinal cord and brain. The bacteria is carried harmlessly in the back of the nose and throat by between 10 and 20 per cent of the population. Symptoms may include fever, chills, aches, nausea, vomiting, drowsiness, and confusion. While the majority of people fully recover, infection can progress quickly and about 5 per cent will die.